Mark Lawrence, Head Professional at Coombe Hill, has an impressively stocked shop, and he and his assistants offer a full range of coaching and equipment to both members and guests. Stocking the very best in contemporary and traditional fairway fashions including leading international brands such as Ralph Lauren, Oscar Jacobson, Peter Millar, Golfino, Lacoste, Kjus and Calvin Klein. The Pro Shop is also major stockist of premium golfing brands in the world of golf equipment and accessories. Whether you are looking for a driver, putter, wedge, fairway metal or a full set of irons, you can enjoy making your club selections from top brands, such as, TaylorMade, Callaway, and Titleist. Demo clubs are available for testing, and our professionals are always on hand to offer advice. 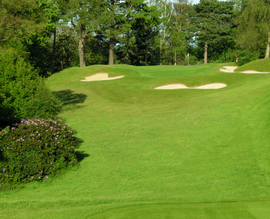 ​The Professional team looks forward to welcoming you to Coombe Hill and fulfilling your golfing requirements.